M. Diane Rogers, club member and Past President of the British Columbia Genealogical Society, will be the guest speaker on Sunday, April 15th, noon – 2 pm. Diane’s presentation will be on War Memorials and related subjects on postcards. Across Canada, community cenotaphs, most built from the 1920s to honour the dead of World War I, are seen in small towns and big cities alike, but other types of war memorials from university gyms to high school tennis courts may also be found. 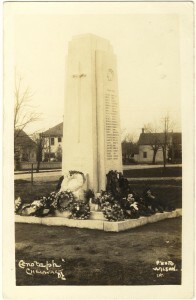 Many of these have been commemorated on postcards, like this one showing the cenotaph in Chilliwack, BC, and believed to have been photographed and produced by Alexander Wilson in the 1930s. Margaret Waddington’s biography of Alexander and Hilda Wilson appeared in Postview, February 2011, published by the Vancouver Postcard Club. Chilliwack, British Columbia, Canada Cenotaph. Postcard; private collection.